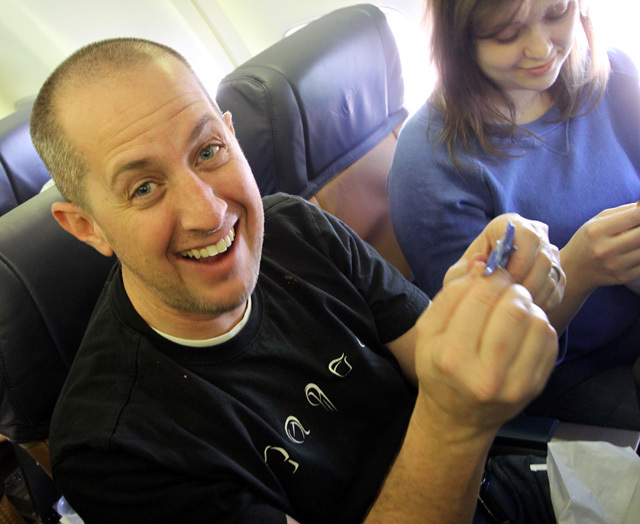 On my Southwest Airlines flight to SXSW 2012 conference, I snagged the front row bulkhead seat. Little did I know, I would soon be in the middle of a very fun experiment put on by our flight attendants, Mandy and LaDonna. 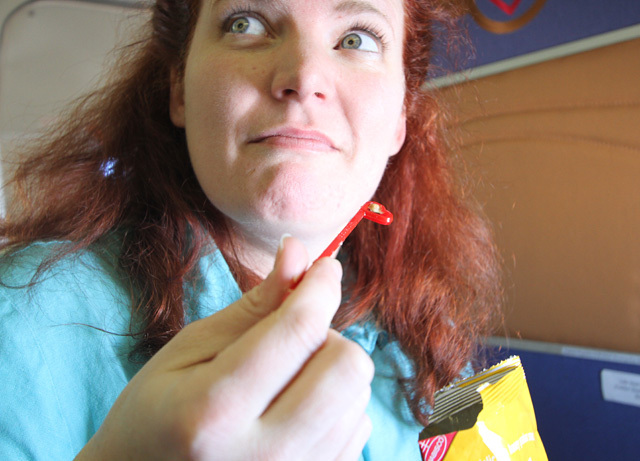 My seatmate Susan and I watched as they filled up ten vomit bags with various food items found in the plane’s galley. Mandy then announced that she wanted volunteers as she had been wanting to try out airplane food recipes with passengers for a long time. Volunteers were chosen (including my seatmate) and she began to tell us how to prepare the recipes. Mandy called the first recipe “Key Lime Cookie Dough Sort Of” and it consisted of crushed airplane-shaped cookies, Coffee Mate creamer and a wedge of lime. 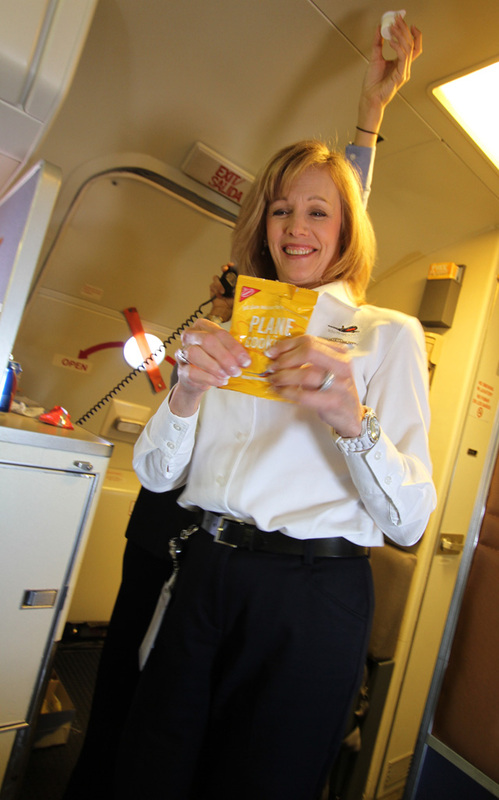 The next was simply peanut butter and several passengers attempted to crush peanuts to a smooth consistency. 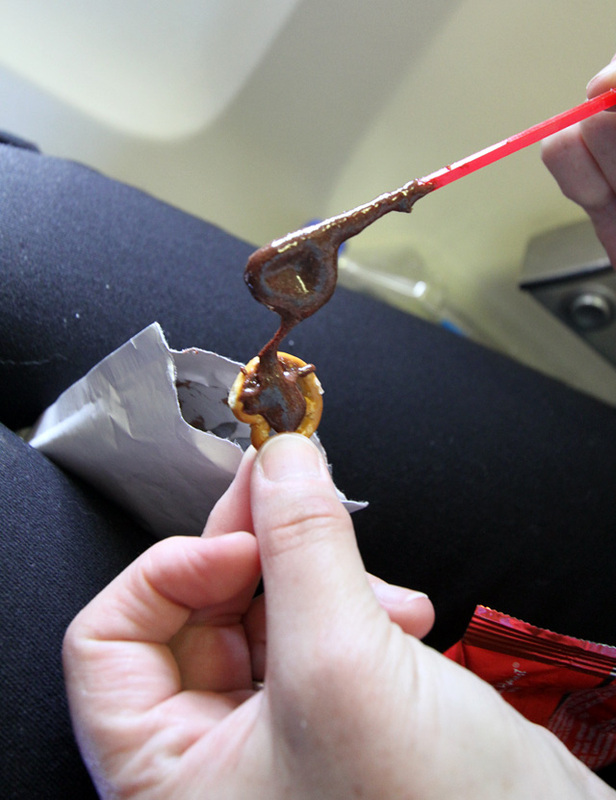 It got even better when the pilot came out and offered up an unexpected suggestion: Chocolate Mousse. It was a simple recipe made of powdered hot chocolate mix and Coffee Mate creamer. We ended up dipping our mini pretzels into the (somewhat delicious) finished “mousse”. Winners were announced and much fun was had by all involved. In fact, it may have been the most fun I’ve ever had on a flight. Special thanks to Mandy and LaDonna!